What is one of the most enduring, appealing play environments for kids that's been around as long as anyone can remember? The sandbox. No summer is complete unless there is a certain amount of sand play. Fortunately the folks over at Little Tikes have made several models to choose from, all with the legendary toughness that Little Tikes products are known for. The Little Tikes Butterfly Beach Sandbox and Wading pool is a sort of two-for-one deal: you get a sandbox in one "wing" and a wading pool in the other. It also comes with a handy umbrella to keep those burning rays off your little one's shoulders. Free form imaginative play with sand is one of the classic rites of childhood. And, of course, free form cleaning up of all the sand that gets tracked into the house is a classic rite of parenthood, but that's OK. The Little Tikes Butterfly Beach Sandbox and Wading Pool retails for around $40. The Little Tikes Sand & Water Table - Builder's Bay - is loads of fun for kids who like building things. Of course, the sand and water don't exactly stay all in their correct places, but that's part of what playing with sand is all about. After all, moist sand packs well for making castles and pyramids. 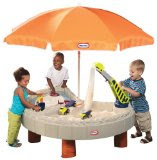 The Little Tikes Sand & Water Table Builder's Bay is a table, so kids stand up and have access to all the space for driving around miniature cars and creating dunes and beaches and who knows what else. While there is a case to be made for sandboxes built into a backyard under a tree fort, there is also one very good reason for parents to consider a self-contained sandbox like the ones from Little Tikes: if you move, all you have to do is dump out the sand and take it with you. Some good ideas to keep the kids occupied outside this summer. Some kids may hate taking a bath, but that doesn't mean they hate water. I have never met a kid that given the chance wouldn't run around in the rain or slash around and play in the puddles the rain leaves behind. Kids love water when they can play in it outside. If you would like to see your child smile from ear to ear just give them one of these really cool water toys and then stand back if you don't want to get wet. Water balloons are a fun and very inexpensive way for kids to play with water. Give your kids a package of balloons and the garden hose and they are set. If you want to get a little more high tech, you can purchase slingshots made especially for launching water balloons. Another of the not too expensive water toys you can buy are water guns. Of course some of the more powerful water guns can get up there in price, but none of them are too costly. Kids can have a ton of fun chasing each other around the yard and shooting each other with their water guns. There are even clip on targets you can purchase to make their water gun fights a little more challenging. We all played in the garden sprinklers as kids, but today there are lots of really cute sprinklers made just for kids to play in. There are sprinklers available that are made for small children like the Elmo sprinkler I bought for my grandsons that allows you to adjust how much water comes out so even the youngest toddler can enjoy the water without getting sprayed in the face. Then there are other sprinklers that are made for older children that wiggle and move and spray water everywhere. Slip and slide mats are another way to let you kids have a little water fun. The original slip 'n slide has been around for over forty years and now is available in several different designs and even some double and triple designs so your kids can have water races. If you want to splurge a little, the inflatable water slides are a big hit with kids and come in lots of different designs and sizes. If you are looking for other fun toys for your kids visit best selling toys for toys for kids of all ages. Trunki Review - Don't Be the Last One to Know About the Latest Travel Craze! If you have children of the toddler or pre-school age then you will know that traveling becomes more difficult as they like to carry their own things. However, carrying your own bag through the airport becomes much less exciting when they realise how tiring the task can be. After all the journey to the departure gate can be too far for little legs. Trunki is the latest travel craze, and the answer to your child's travel problems. The Trunki ride on suitcase is a new breed of child sized luggage which doubles up as a ride-on toy, perfect for when their little legs get tired. The sturdy case is made of the same material as adult luggage and is built to last. It's light enough for a small child to carry (just four pounds when empty) but strong enough for them to sit on and be pulled along by mum or dad. The wheels roll smoothly on tile or low-pile carpets and the brightly coloured cases can even carry more than one child! The 18x18x12 case is approved as airplane hand luggage and is big enough for your child's snacks, games and even spare clothes. So it's perfect for keeping them entertained during the flight too. Please be aware though, if you are planning a long trip, or need to pack bulky clothes like sweaters, then you might need an additional bag to put those in. Trunki comes in a variety of colours and styles and is sure to turn heads as you pull your little one through the airport. 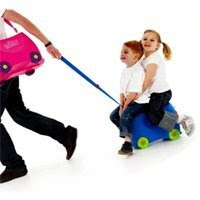 Now you have learned why the Trunki ride on suitcase is the latest travel craze visit http://www.trunkirideonsuitcase.com to find out how you can get free shipping today! You know why a lot of us didn't like school? It was simply kind of boring. For some of us, it was challenging, but for many, it's just that the material was already old to us by the time we got to it. If you were already reading Doctor Seuss before you ever started first grade, you were probably ready for a little something more by that point. Some of us got lucky and were maybe skipped ahead a grade or two, while others simply had to settle for being the bored smart kid in the class. When you're young, you tend to latch on to certain things, and it's important that your parents nurture that interest (even if it does result in boredom at school). For example, when a kid who's always been playing around with Legos toys, K'nex and other mechanical toys starts learning about simple and complex machines in school, he or she is going to wind up saying "Haven't I already been over this?" The wise teacher will administer some slightly advanced curriculum to the child. Being way ahead of the class, again, while it can make school a little dull, winds up being very important later in life. It's always the kid who found grade school dull who winds up being accepted to an elite academy for future engineers. If you want to facilitate your future-engineering-genius's creativity and grasp of the material, the good news is that you have quite a lot of options. The better toymakers out there craft their products with an understanding of the way a child's brain functions. Kids don't think they're training for a career in designing new ways to harvest and cultivate food, or that they're going to engineer an ingenious solution to fossil fuels, they're just having fun, putting different things together and seeing what they come up with. Legos are a no brainer. Particularly any legos toy kit full of moving parts, gears, wheels and axles. Lego's Technic line is particularly great. Each kit is built with a certain thing in mind. One might make a real working bulldozer, another might make a race car, but if you get a few kits, you can piece the different parts together and make pretty much anything you can come up with. Meccano is another great line of developmental toys if you want to step up from the simplicity of Technics. Meccano actually comes with a few simple tools and requires kids to put together cars, airplanes and other machines with small pieces of colour coded sheet metal, as well as nuts and bolts. But dig this, if you want something really cool, you can go for the Haynes internal combustion engine. It only costs about sixty five bucks, which isn't much when you consider what it is: A simulation of a real, working internal combustion engine. Now, it doesn't actually require gasoline or anything, it's not a real engine, but rather, an electronic simulation of one. It's a small model of a real four cylinder engine. It comes with spark plugs, tools, nuts and bolts, and all the instructions you'll need to put it together. It teaches how a real engine works, and it makes all the cool sounds you expect from a real engine. It's as close as you can get to real engineering without filling your living room with carbon monoxide! Children's toys are basically a combination of toys or games designed specifically to allow a child to learn and inculcate various traits while they play. Children generally living in their high energy modes can canalize their time and efforts into making learning and playing a thing that can be done simultaneously. If you are a super parent then you would probably always be on the look out for such toys in the hope that the ever wavering attention of your child is held long enough to enable them to learn something worthwhile as they fiddle around with the newest of toys that you bought. In a time when the tried and tested method to keep a child held at a place without letting them involve in mischief is to either letting them watch television or play video games, these toys are sure to provide the parents with an alternative way out of the conundrum of how to ensure that their child spends spare time without letting any of the time spent go to a waste. It is also of significance that studies show children involved in playing with such toys have a lower susceptibility to neural diseases such as Alzheimer's disease and dementia. The onus however is on the parents to make sure that a lot of such challenging games are present in the house and that the child is always encouraged as well as coerced into being involved with them in spare time. The following list highlights a few of the basic and common children's toys available and their utility in a child's development. * Clay molding sets: These types of toys allow the creativity of the child take to the forefront as they mould figures and objects randomly. Available in varied colors they also fascinate the child as they make replicas of real life things such as a car or a dog as such. It is visually stimulating and helps better the hand eye co-ordination and motor skills. * Dolls and stuffed toys: These inculcate the sense of possession, caring and bonding in the child as he or she plays with and indulges in dressing up or feeding the toy. It also helps in encouraging the child's emerging senses. * Building blocks: These allow the development of the child's motor abilities as he/she engages in building structures and patterns in varied levels of difficulty and complexity. It helps augment the sense of cause-effect in the child's mind. * Flash cards and edutainment games: suitable for slightly older children and allow them to enhance their memory and knowledge base. It also helps them to getting a hold of basic mathematical concepts and quantitative skills. Apart from the above mentioned toys there are also a lot of other toys serving the noble purpose of keeping your child busy as well as learning. As a parent it would be open to your choice as to what kind of toy is most suitable for your kid. So no matter what you buy, do buy something that challenges the intellect of your child and makes him challenged by it so as to try for as long as it takes. Be sure to check the instructions and safety parameters being followed by the manufacturer so as to ensure safety for your child. All said and done, get your child a toy that is more than just a item to while way time. Sit back and relax as you see your child enjoy. Baby toys - At ebeanstalk, we carry a unique selection of 1 year old toys, 2 year old toys through toys for 7 year olds. Our collection of educational & learning toys for babies, infants & toddlers from 100+ manufacturers will truly match your child's development. A folding trampoline is a great way to give your kids all the fun of bouncing up and down for hours at a time, yet still be able to tuck it away in a small space for storage, or when not in use. The way it works is that the four legs will tuck up and under the actual trampoline, and then it is only a few inches thick. You can store it standing on its side in your garage, or if small enough it may even fit in a closet. The folding trampoline is an alternative to gargantuan counterparts which can take up in some cases the entire space of your lawn. Those kinds tend to get weather-beaten and are not necessarily so attractive to passersby. They are also less safe, merely because of their height off the ground and the extra bounce power that comes from the wider area they have. No trampoline should be used by kids younger than three. They just don't have the coordination and self-protective bones to take a hard fall at that age. 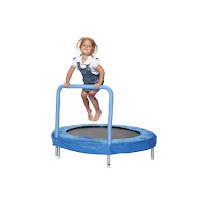 But as soon as they are old enough, a folding trampoline may strike the perfect balance between safety and comfort on the one hand, and keeping your yard from looking over-ridden by kids' toys on the other. Plus, it'll get them out of your hair for hours at a time. Lastly, I would recommend testing out the trampoline before purchasing, as they are not all made with the same quality and stability. You should also inquire into whether the feet of the toy will scar up floors if used inside. If you walk into any classroom in the country, you're going to have every little boy and girl pegged within a few minutes when it comes to what they're into. That girl reading National Geographic loves animals, the boy over there doodling in his notebook and ignoring the teacher is the artist, and the kid holding his fists in the air in front of him going "Vrooooom, vroooommmmm! EEEEEE!" is obviously the one who's into cars. It's one of those fascinations that, for many of us, begins in early childhood and carries right on into adulthood, and then right on into old age. While in real life, we may have to settle for a more affordable and modest vehicle, leaving the hot rods and custom machines to racers and movie stuntmen, the escapism of a good car chase flick, or just a walk through a classic car show leaves most adults with a smile on their face, thinking about what we could drive if only we didn't have to hold down a job and maintain a respectable living! If it's your son or nephew who's nuts about V8 engines and knows more about fuel injection than you do, here are a few words of advice: Encourage that. Whenever you go to work on the car, let the boy tag along, explain to him what you're doing and allow him to help out. At the very least, you're going to raise a kid who can take care of these things for himself when he reaches driving age. And secondly, keep encouraging his infatuation with cars with the right toys. Some of the coolest cars toys actually come from Legos. Lego racers, for instance, are pretty cool. They let the kid put together a race car either based on the instructions, or they can build one of their own design. And of course, you simply cannot go wrong with remote control cars. Back when we were kids, these were pretty much the cool toy, and they still are. Sure, you can play racing video games these days, but do racing games let you build your own race tracks in the backyard? Do you get the same viscera thrill racing in a video game that you do hearing the whirr and buzz of the electric motor of a remote control car? Can you set up a bunch of used soda cans and try to stage spectacular crashes into the stack? Remote control cars offer room for imagination that's hard to attain with an Xbox controller. And of course, if your kid is still a bit young for something as complex as a hundred piece lego set or a remote control car or something, there are plenty of things for the young, car loving child. Wooden toys, for example, They may not fulfill that need for speed, but they're a safe, easy alternative when your kid is just obsessed with automotives and you know he's not ready for something made for older children just yet. Yogee.com.au is a leading Australian online toy store. Visit yogee.com.au for a wide selection of Kids Toys at discounted prices. To save money on your next purchase, please visit Kids Toys.